At the moment, the current BMW M140i, a fan favorite among BMW enthusiasts, is a great little sports car but it’s isn’t a proper performance car. Sure, its 340 hp from its 3.0 liter turbocharged inline-six helps it get from 0-60 mph in about 4.5 seconds and that’s quick. But it’s more Audi S3 quick, rather than Audi RS3 quick. There’s word, though, that BMW wants to push the M140i upmarket in terms of performance and have it take on the faster Audi. The Audi RS3 is the primary target apparently, which is more powerful and quite a lot faster than the current M140i. 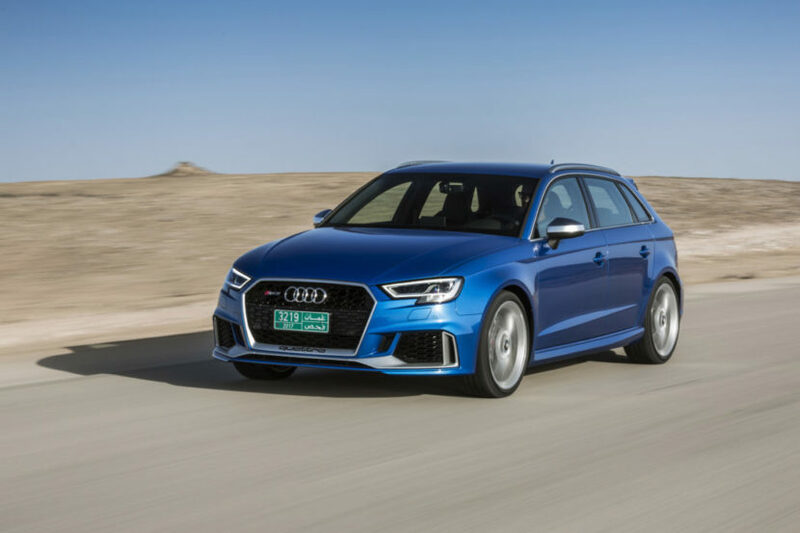 With a 2.5 liter turbocharged five-cylinder, the RS3 makes 400 hp and gets to 60 mph in about 3.7 seconds. So it’s a little rocket ship. Now, BMW might have a hard time reaching that with the M140i, which is why this move upmarket might not happen. The reason that’s tough for BMW is the layout of the M140i. It’s going to be front-wheel drive-based this time, likely with all-wheel drive as-standard, so that means BMW needs to use a transverse engine layout, rather than its typical longitudinal layout. The only engines BMW has that are compatible with this chassis layout are little turbo three and four cylinders. We’ve heard that the next BMW M140i will use a 2.0 liter turbocharged four-cylinder, likely a tuned version of the B48 engine in most current Bimmers, which will make around 300 hp. That’s not enough to take on the 400 hp rocket-sled that is the RS3. So we’re not so sure BMW will be able to tune that engine up to make enough power to break into the three-second range to 60 mph. If the new car is significantly lighter than the old one and can push around 350 hp, with all-wheel drive, it should be able to be faster than the old car. But faster than the RS3 or even the Mercedes-AMG A45? That’s a tough one. Previous post 2019 BMW Z4 M40i… Shooting Brake? And then the magic happens: the addition of an electric motor. A little bomb. That magic could be 200kg heavier like the 330e is from 320i (both have the same engine). Unless you want a quick hatch in a straight line, then it’s not an issue. Can BMW crank 400hp from a 2.0 engine like what AMG will do with the upcoming A45? I guess it’s possible but it’s not what we’re hearing. We’ve heard about 300 or a bit more hp, not 400. Though, we’d love to see BMW do that. A boosty little turbo-four, just like Audi’s turbo-five, would be awesome. They’ve been doing MINI for over a decade. MINIs are pretty cool but the JCW Hatch hasn’t quite reached that sort of magnitude yet, and it’s not because it’s a segment below. It sounds good, looks quirky, goes pretty fast (and even in all of this the Yaris GRMN got it beaten) but in terms of driving dynamics it’s not the leader a BMW should be. They still have to prove that they can, IF they can. MINI were going under when BMW not only salvaged them but turned them into a $5 billion global brand that inspired Fiat to revive the 500. If Yaris is the benchmark why did its manufacturer turn to BMW to revive the Supra? And the 300 hp. JCW doesn’t exist. Yet. The crowd that cares about how well the BMW Group is doing financially doesn’t even know what a Yaris GRMN is while the crowd that loves the Yaris GRMN doesn’t have much business knowing about how BMW is doing from a financial standpoint (other than them no being bankrupt, of course). But the first crowd pushes BMW to build FWD cars, while the second hates them. And it’s the second that buys M cars… And they have to prove it to them. To us, to me. Since Yaris is built by Toyota & BMW engineered new Supra you are making absolutely no sense whatsoever. The new Z4 I6 doesn’t have 400 hp., would BMW upset their own apple cart? This is the same kind of wishful thinking that predicted a lightweight F87 with a highly boosted I4. Realistically, we all know BMW just doesn’t do things like these. I don’t see the M140i in competition with an RS3 or A45. Isn’t it more the battlefield for the M2? If the new M2 continues to be rwd. coupe, very different segments. Different – yes. But very different? No. If you want to see it that way, what Audi or MB is to compare with an M2? There is none. That’s part of its importance & why I hope it doesn’t change 2nd. gen. One of our local papers just suggested it’s the best performance car available under 6 figures. I hope the 1 Series brings something new to the market & BMW. So basically BMW wants to make M140i bonkers fast, but not fun. For current M140i with B58 turbo six cylinder it should be easy task to take it past 400bhp. However, that would take to M2 territory. So, no go…. New FWD/AWD 1er with 48B engine will struggle to get past 300bhp. And here again…M2? Currently BMW has nothing meaningful to employ in FWD 1er. Currently? Thought new 1 Series & JCW were both going to be 300 hp? 300 hp. would be meaningful enough to me. Ok. But, BMW has no engine in FWD configuration with 300bhp on tap…..at least not yet…. Tuners have been doing it for a while, corporate prototypes seen testing @ Nurburgring last year, next JCW as well. Sorry, but no official word from BMW…. Probably not until reveal. But widely reported elsewhere, including here. This is funny. People complain about fwd. BMW while ignoring it took decades to get to a rwd. 3 Series with 300 hp. But now it arrives in a smaller, lighter 1st generation fwd. – bring it, Bavarians! Still no official word from BMW…..
Why would they before unveil? Not all JCWs, only F54 and F60. RWD and laptimes are the past. Drag races and all wheel drive belongs the future. Gridlock & autonomy are the future. The collapse of the global financial system will take place in autumn 2019.